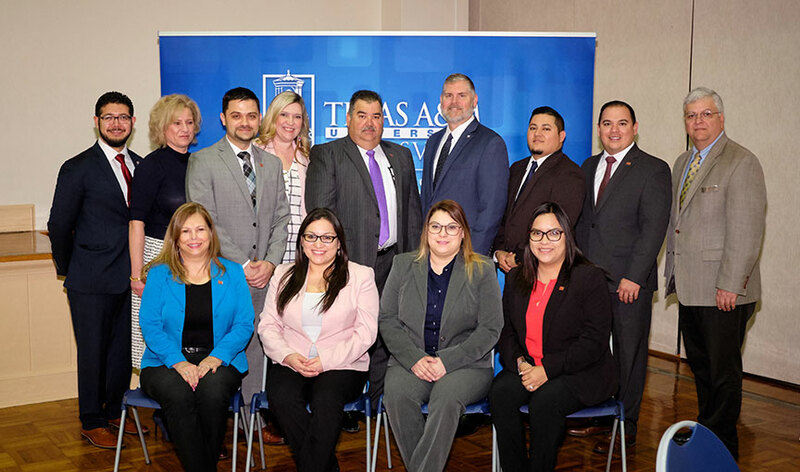 Photo Caption: IBC Bank-Zapata managers and officers, and faculty from the TAMUK College of Business Administration pose with with Chris Furlow, CEO Texas Bankers Association. Left to Right: Seated- Janie De La Garza, Noelia Nunez, Cynthia Perez, and Mayra Lopez. Standing- Cesar Robledo, Dr. Natalya Delcoure, Eloy Lopez, Tanya Longoria, Ricardo Ramirez, Chris Furlow, Javier Ramirez, Ruben Perez, Dr. Jesus Carmona. IBC Bank-Zapata, in partnership with the Kingsville Chamber of Commerce and the Kleberg Hispanic Chamber of Commerce, was the presenting sponsor of the 9th Annual TAMUK College of Business Administration Community Breakfast on Thursday, March 21 featuring guest speaker Chris Furlow, president & CEO of Texas Banker's Association. This annual educational event provides an opportunity for students and local business leaders to network and learn together. IBC Bank-Zapata President Ricardo Ramirez delivered welcome remarks, commending the university and the College of Business Administration for developing qualified graduates who are ready to enter the workforce. IBC Bank-Zapata has been a proud $5,000 sponsor of this event since 2013, and currently employs four TAMUK alumni as bank officers and managers. This year's presentation topic was "21st Century Bank Leadership: Tech, Talent and Transformation." Furlow shared his expertise on the current landscape of banking including industry-strategic transformation in regulations, banking technology and risk, and recruiting.